CBC Investigates | Only one major city in Canada — Halifax — staffs a police force that is as racially diverse as its community, CBC News has found. All other major law enforcement agencies across the country fail to reflect their communities’ diversity among their ranks, leaving large swaths of visible minorities and Indigenous populations without representation. While 57 per cent of Peel region, outside Toronto, is diverse, its police force has only 19 per cent non-white officers. 54 per cent of Vancouverites are from minority groups, whereas 22 per cent of its police force match that profile. For York region, also neighbouring Toronto, that ratio is 44 per cent for the population, but 17 per cent for the police force. In Edmonton, 35 per cent of its citizens are visible minorities or Indigenous, yet those groups are represented in less than 10 per cent of its police force. In Nunavut, 12 per cent of the police force is Aboriginal, but the territory is almost 90 per cent Indigenous. These findings come as minority groups across North America are shining the spotlight on allegations of abuse of authority and discrimination among polices forces. In May, CBC News surveyed all major police forces in Canada in order to establish a national snapshot of the racial diversity of key law enforcement agencies. These figures were then compared to the demographic makeup of the public for each community using the results of the 2011 National Household Survey to calculate the disparity between the racial profiles of police and general populations. Akwasi Owusu-Bempah at the University of Toronto, who has studied the relationship between race and the justice system in Canada, says certain results from the analysis surprised him. “I was a little disheartened to see some of the RCMP numbers, for the North for example, very, very small numbers or very low representation of racialized or minority officers policing in the North,” he said. While he singles out the Toronto Police Service for having made ground on diversifying its force, Owusu-Bempah says there’ is still work to be done. “About 50 per cent of Toronto’s population is not white, whereas only 25 per cent of the police service is, so we’ve clearly got a ways to go,” he said. The head of the Canadian Association of Chiefs of Police says these numbers alone are not reason for concern. “I’d say we are just on a learning curve right now,” said Clive Weighill, who is also chief of the Saskatoon Police Service, which fared relatively well in the analysis. “I think we’ve made a lot of progress. If you would compare policing to private corporations or other civic or municipal corporations, I think you’d see our numbers are drastically ahead of most people,” he said. 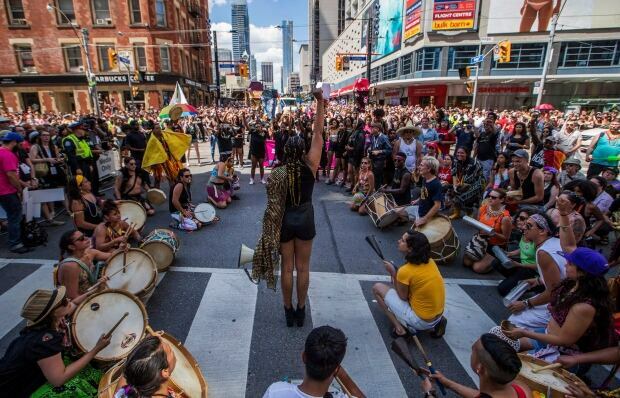 Black Lives Matter Toronto co-founder Sandy Hudson said that while the findings do not surprise her, she is unsure whether diversity targets will necessarily bring about change. “I don’t know whether or not more racialized faces on the police force is going to change that,” she told CBC News. “A lot of people pointed to the new police chief in Toronto as somehow heralding some sort of new era in relationships between the Toronto police service and the black community because the new police chief, Mark Saunders, is black. “There has to be a real commitment to changing policy, to changing structure, and to changing the institution as a whole, otherwise these issues don’t really get solved,” said Hudson. Owusu-Bempah adds that the degree to which traditional police culture can assimilate racialized officers should not be underestimated. “They are immersed in the same police culture, and that police culture shapes how they act and how they think,” he said. “Hire people that are older. Hire people that have more life experience and hire people that have been exposed to different groups of people,” he says. He added that the Saskatoon force has full-time Indigenous recruiter on staff. The survey results showed that some of the country’s least racially diverse police forces were also among those that most closely represented their communities in terms of the percentage point gap. Police in Quebec City and Sherbrooke reported having a combined total of 12 Indigenous and visible minority officers out of a total of nearly 900. However, because the small amount of diversity in their communities, police in those cities closely mirrored the population in terms of percentage point. 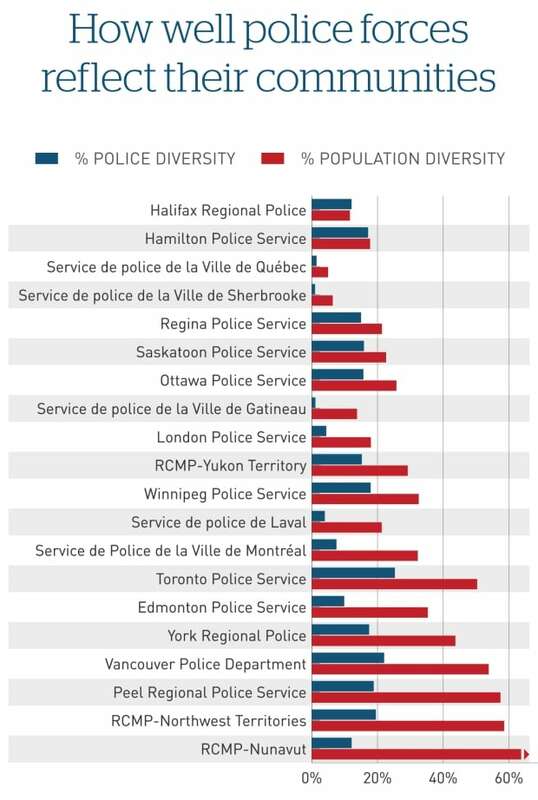 While proportionally, the populations are at times multiple times more diverse racially than the police force in some communities, because of the relatively smaller numbers of visible minorities and Indigenous residents, the number of minority group police officers required to achieve representation is much smaller than larger metro areas where, in some cases, hundreds of such officers would need to be hired. Owusu-Bempah warns that, while these cases may seem innocuous, the makeup of a community can evolve rapidly, leaving police forces to play catch-up down the road. The Toronto Police Service says one of the key impediments to achieving better representation is that the rate of officer turnover has been outpaced by the rapidly changing community. “In 2000 we were at about nine per cent visible minority. We’re now at about 24 per cent,” says Mark Pugash, director of corporate communications for the force. Pugash says that when Toronto police hire, they have focused on recruiting Somali Canadians, and have also been successful in debunking certain myths about policing through a program that teams up youths with officers. The CBC News survey found that Halifax Regional Police was the only force to match or surpass the racial diversity of its community, with Hamilton close behind. The Halifax chief says conflicts in the early 1990s led the force to re-evaluate its recruiting methods. “The most important thing is diversity of thought. We want to be able to encourage the best decision making possible,” he said. Owusu-Bempah believes the lack of high quality data in the justice systems — as opposed to what is available in the U.S. and the U.K. — limits our understanding of the scope of discrimination. He believes that goal-setting on the basis of diversity metrics such as white versus non-white is simplistic. “In the absence of data showing that there are disparities or discrimination, no problems exist,” he said. However, the Canadian Association of Chiefs of Police cautions that gathering race-base statistics can create a climate of mistrust. The Calgary Police Service was the only agency surveyed that said it did not gather statistics on visible minorities and Indigenous people within its ranks. CBC News surveyed the 21 largest municipal police services in Canada, the Ontario Provincial Police (OPP), the Sûreté du Québec (SQ) and the RCMP in every province requesting their most recent statistics on the racial makeup of their sworn officers. Certain police agencies were excluded from the final analysis because they did not have statistics that distinguished between sworn officers and civilian staff, they did not gather racial statistics on their police officers, or — as was the case for the OPP, the SQ and most of the RCMP — determining the demographic profiles of the territories over which they have jurisdiction posed many challenges with regards to accuracy.